Offering you a complete choice of products which include Cable Lugs such as Tubular Cable Lugs, Copper Tubular Cable Lugs, Aluminum Lugs, Tubular Angle Cable Lugs and Angle Compression Cable Lugs. We are among the leading manufacturers, suppliers, traders and exporters of Tubular Cable Lugs in the industry. Extensively used in electrical circuits, these lugs are widely demanded in the market. Customers can avail these lugs in several specifications, depending upon their needs. These lugs are known for their dimensional accuracy and optimum surface finish. Premium quality materials are utilized in their manufacture. We are among the pioneers in the industry, offering Copper Tubular Cable Lugs for our esteemed customers. These cable lugs find application in electrical panels and circuits and are made available by us in several designs and sizes. Premium quality copper is procured from reputed vendors for manufacturing these lugs. Offered lugs are made available in bulk quantities as well. Backed by our vast domain expertise, we bring forth Aluminum Lugs for our priceless customers. These lugs are manufactured in adherence to the established industry standards using high grade aluminum characterized by high conductivity. With their electroplated surface, these lugs have excellent resistance properties. We can process bulk order within the given time frame. We are engaged in offering a wide range of Tubular Cable Lugs in different ampere ranges. 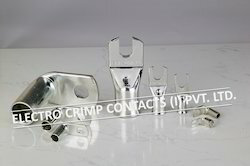 The products offered in this range are used as in-line connector for wires in different cross sections. Customers can avail these cable lugs in high-grade packaging and at market leading prices. Looking for Cable Lugs ?